MG Motor UK, which has doubled its part sales activity over the past 12 months, has extended its contract with TVS Supply Chain Solutions. Mark Toon, of TVS, left, and Harvey France of MG at the Longbridge parts centre. 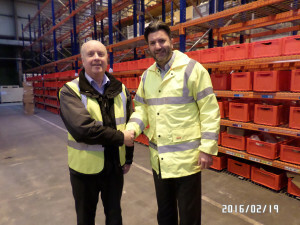 TVS provides warehousing and inventory support services to MG at Longbridge. It is also managing a project that brings further enhancement to the warehouse facility, which aims to be completed by April to meet the additional capacity requirements. During the spring of 2015, a new MG6 was launched and plans for a new SUV were unveiled for 2016. This growth has led to MG part sales activity increasing significantly in the last 12 months. MG is owned by Chinese group SAIC Motor Corporation. Harvey France, MG head of aftersales and parts, said: “TVS provides a first class service in operating the MG Aftersales Parts Warehouse. This specialism has, for the last five years, enabled MG to focus its efforts on the development of parts sales, aligned to MG’s rapidly growing vehicle park. As a result, MG’s parts and accessories turnover has increased 59 per cent year on year (2014 to 2015). TVS continue to be ‘an ideal fit for MG’ as we harmonise our respective skill sets to achieve and support further growth”.